The most common comment in this long and complicated MBA Mondays series on Employee Equity is the question of how much equity should you grant when you make a hire. I am going to try to address that question in this post. First, a caveat. For your first key hires, three, five, maybe as much as ten, you will probably not be able to use any kind of formula. Getting someone to join your dream before it is much of anything is an art not a science. And the amount of equity you need to grant to accomplish these hires is also an art and most certainly not a science. However, a rule of thumb for those first few hires is that you will be granting them in terms of points of equity (ie 1%, 2%, 5%, 10%). To be clear, these are hires we are talking about, not co-founders. Co-founders are an entirely different discussion and I am not talking about them in this post. Once you have assembled a core team that is operating the business, you need to move from art to science in terms of granting employee equity. And most importantly you need to move away from points of equity to the dollar value of equity. Giving out equity in terms of points is very expensive and you need to move away from it as soon as it is reasonable to do so. We have developed a formula that we like to use for this purpose. I got this formula from a big compensation consulting firm. We hired them to advise a company I was on the board of that was going public a long time ago. I’ve modified it in a few places to simplify it. But it is based on a common practive in compensation consulting. And it is based on the dollar value of equity. The first thing you do is you figure out how valuable your company is (we call this “best value”). This is NOT your 409a valuation (we call that “fair value”). This “best value” can be the valuation on the last round of financing. Or it can be a recent offer to buy your company that you turned down. Or it can be the discounted value of future cash flows. Or it can be a public market comp analysis. Whatever approach you use, it should be the value of your company that you would sell or finance your business at right now. Let’s say the number is $25mm. This is an important data point for this effort. The other important data point is the number of fully diluted shares. Let’s say that is 10mm shares outstanding. The second thing you do is break up your org chart into brackets. There is no bracket for the CEO and COO. Grants for CEOs and COOs should and will be made by the Board. The first bracket is the senior management team; the CFO, Chief Revenue Officer/VP Sales, Chief Marketing Officer/VP Marketing, Chief Product Officer/VP Product, CTO, VP Eng, Chief People Officer/VP HR, General Counsel, and anyone else on the senior team. The second bracket is Director level managers and key people (engineering and design superstars for sure). The third bracket are employees who are in the key functions like engineering, product, marketing, etc. And the fourth bracket are employees who are not in key functions. This could include reception, clerical employees, etc. NOTE: The numbers below are as of 2010. They have moved a lot since then. I am working on an updated set of numbers. The Senior Team numbers have moved the most. I would not recommend using these numbers or you will be below market with your employee equity grants. 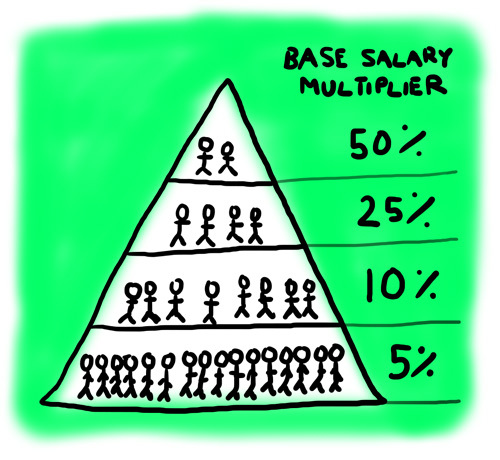 Then you multiply the employee’s base salary by the multiplier to get to a dollar value of equity. Let’s say your VP Product is making $175k per year. Then the dollar value of equity you offer them is 0.5 x $175k, which is equal to $87.5k. Let’s say a director level product person is making $125k. Then the dollar value of equity you offer them is 0.25 x $125k which is equal to $31.25k. Then you divide the dollar value of equity by the “best value” of your business and multiply the result by the number of fully diluted shares outstanding to get the grant amount. We said that the business was worth $25mm and there are 10mm shares outstanding. So the VP Product gets an equity grant of ((87.5k/25mm) * 10mm) which is 35k shares. And the the director level product person gets an equity grant of ((31.25k/25mm) *10mm) which is 12.5k shares. Another, possibly simpler, way to do this is to use the current share price. You get that by dividing the best value of your company ($25mm) by the fully diluted shares outstanding (10mm). In this case, it would be $2.50 per share. Then you simply divide the dollar value of equity by the current share price. You’ll get the same numbers and it is easier to explain and understand. The key thing is to communicate the equity grant in dollar values, not in percentage of the company. Startups should be able to dramatically increase the value of their equity over the four years a stock grant vests. We expect our companies to be able to increase in value three to five times over a four year period. So a grant with a value of $125k could be worth $400k to $600k over the time period it vests. And of course, there is always the possiblilty of a breakout that increases 10x over that time. Talking about grants in dollar values emphasizes that equity aligns interests around increasing the value of the company and makes it tangible to the employees. When you are doing retention grants, I like to use the same formula but divide the dollar value of the retention grant by two to reflect that they are being made every two years. That means the the unvested equity at the time of the retention grant should be roughly equal to the dollar value of unvested equity at the time of the initial grant. We have a very sophisticated spreadsheet that Andrew Parker built that lays all of this out for current employees and future hires. We share it with our portfolio companies but I do not want to post it here because it is very complicated and requires someone to hand hold the users. And this blog doesn’t come with end user support. I hope this methodology makes sense to all of you and helps answer the question of “how much?”. Issuing equity to employees does not have to be an art form, particularly once the company has grown into a real business and is scaling up. Using a methodology, whether it is this one or some other one, is a good practice to promote fairness and rigor in a very important part of the compensation scheme. I like the $ value approach to equity – it is how I’ve done it for a long time. I do still feel strongly that employees should be told their % ownership, preference structure and any other pertinent details even if the $ value is (rightly) the number emphasized. I am constantly amazed how many companies say % ownership (or equivalently # of outstanding shares) is a trade secret or whatever. Yes and no. I understand what you’ve written, but my reality has been somewhat different. I don’t know. Perhaps the startups I participated in were exceptions and not the rule. Let’s take OPS Inc (name changed to protect the guilty), a private tech firm, as one example. As one of the first 14 or so “key people” I was issued several thousand shares common. More than half had vested by the time we parted ways (company-wide layoffs). Through a bit of creative accounting gymnastics during out-processing, I was told that I had to either fork over a payment for the shares not yet vested (over $25k) or surrender an equivalent portion of vested shares to the company. In other words, I couldn’t just voluntarily surrender the shares that had not yet vested…even if I didn’t want them. The company expected to get paid. And, frankly, I wasn’t interested in pursuing the legality of it all. Several thousand shares evaporated in an instant. Several years passed along with a couple rounds of additional VC funding and further dilution. I received a letter informing me that common was reverse-split 5-to-1 (with no corresponding increase in value). More than a thousand shares reduced to a couple hundred. When the company was finally acquired a decade later–and the dust settled–all that remained was a check for less than a couple thousand dollars. The founders and investors walked away with many millions, as did the senior managers who joined later in the company’s lifecycle. As for the original group of “key hires” who took the company from nothing to its first several million dollars revenue and $50+ million in funding…well, I would imagine they shared in my experience. New hires must clearly understand that all is not what it seems with equity. They tend to get fixated on anticipated or estimated value (best, fair or otherwsise). In a startup, equity dollar values are as meaningless as percentages. With the stroke of a pen employers can–at a later date–dramatically alter one’s equity stake upward OR downward. If equity is their primary motivation (as it is for many even though they’ll deny it), then I suggest they’re either in it for the wrong reasons or need to find a line of work in which the rewards are well defined. Otherwise they may find themselves disappointed later in life. I just think in all these cases when you get screwed you just have to accept it as par for the game. A lot of VC’s will screw youin every way possible if they can, to think otherwise is wrong. Very rarely will you come across a VC who wants to be fair, if and when you find one you make sure you hold on to the relationship. If and when you ever join a startup and are issued a offer letter make sure you have a lawyer ( not their lawyers) go through it and explain to you what you are getting into. Every time the terms change you need to have it reviewed, it is sad that you have to do that as one would hope it is all kosher and fair, but as I have seen many such transactions with bad outcomes I will say you have to be on top of things and be a hawk looking out for your interests even if you have altruistic thoughts. Not everyone believes in doing the right thing always, only when forced to do they do so. This article was originally written by Fred Wilson on November 22, 2010 here.